There is this ultra-orthodox religious Jewish magazine named Ami Magazine, I was actually profiled in it a few months ago. The interesting part is that when you Google the name, [ami magazine], Google filters the word "ami" due to Safe Search. The word "ami" has been filtered from the search because Google SafeSearch is active. When you turn SafeSearch off, you do indeed get amimagazine.org in the number one spot, even with sitelinks. But with SafeSearch on, which it is by default, you won't get that result. The magazine even has its own Wikipedia page. What is interesting is that AMI is also short for "Association Montessori International" and the various Montessori organizations, which Google's co-founders are very into. So why is ami not a safe word? It may have to do with amiaustralia.com.au, which is an organization named Advanced Medicinal Institute that is about men sexual health. But even that seems a stretch. (1) Why is ami not a safe word? (2) Google your name before you go with it. 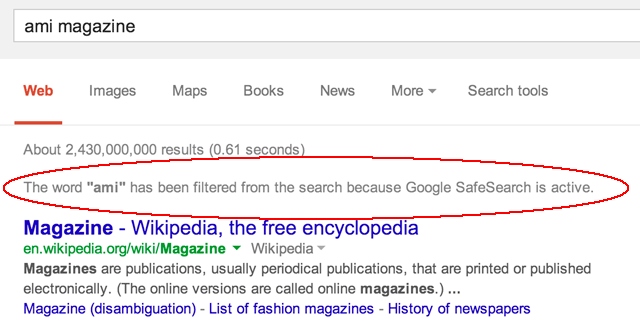 Although, they may have done that and Google's SafeSearch index may have changed since then.